We have seen the most sought displays for the GTX 1080Ti recently. Today, I will review the best-known monitors for GTX 1060 graphics card. The NVIDIA GTX 1060 is a great graphics card which provides stunning experience when you get FHD screen with 1080P or 1440P resolution. It has a silent running operation and low power consumption. If you overclock the system more than often, then you will love to get this graphics card from NVIDIA. As the NVIDIA GTX 1060 is a mid-range graphics card, it mostly supports the games that run on 1080P or 1440P screens. Some users also ran 4K videos with GTX 1060, but they accounted for the fluctuation in FPS in some AAA games. They got balanced FPS only after they turned down the settings substantially. So, on an average, if you want to get the best performance from the GTX 1060 in your system, then you should look for the 1080P or some 1440P displays with IPS panel and 60HZ or 144Hz refresh rate. You can also go for the TN panel instead of IPS by compromising with some color output, but you will get a faster response time in TN display which will be a significant advantage in fast-paced games. 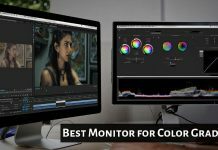 In this post, I will review both types of monitors with compatible refresh rates and resolutions. Check them and choose the most suitable display according to your needs and budget. 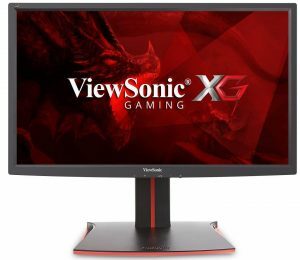 The first on the list is the fantastic FreeSync 24” display from ViewSonic. The XG2401 delivers excellent image quality and a plethora of other features to provide you good gaming experience. Its TN panel will deliver super-fast response time of 1ms with a stunning refresh rate of 144Hz. It comes with a native resolution of 1920 x 1080 pixels (1080P). The FreeSync adaptive synchronization technology from AMD will offer smoother frame rates to put you ahead from the competition in the battle games. It is perfect for using in a dual-monitor setup with laptops, PCs, and Mac systems. The ergonomic stand and a blue-light filter will provide a superior comfort that is needed for the marathon gaming sessions and other on-screen works. Any type of game you are playing including MOBA, RTS, FPS, and eSports; there are pre-set visual modes for them which you can also customize as per your needs. It comes with a DisplayPort, an HDMI port, and a USB hub for connecting your multiple devices. You will get a three-year warranty for this product. In the box, there is also a USB 3.0 cable, one DisplayPort cable, and one power cable included. You can also choose from the 27” or 32”curved design available for this unit. The U2715H is an IPS LED-Lit display from Dell. Its wide viewing angles along with sharp resolution are perfect for both, the work productivity and high-end gaming on your GTX 1060 GPU. This ultrasharp screen from Dell has the right combination of features, performance, and price. 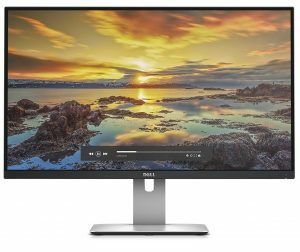 What will you get in this Dell Ultrasharp U2715H Display? If you are a beginner and don’t know what exactly your settings would be in the monitor, then you need not worry about that because it comes with a decent default setup from the factory. Its 27” screen has a Quad HD (QHD) resolution of 2560 x 1440 pixels (1440P). With 178-degree horizontal and vertical viewing angles and excellent color consistency, you will get superior clarity and sharp pictures from almost any direction. The mercury-free LED IPS panel has an sRGB ratio of 99% which will deliver excellent performance without losing the color compilation. It is compatible with all the computer Operating Systems. You can directly use it with the plug-and-play option without installing drivers. The three-year hardware limited warranty and three-year advanced exchange service will allow you to have a hassle-free purchase. 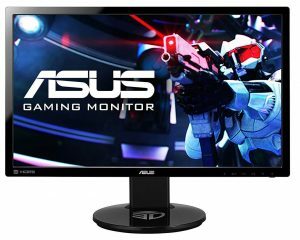 If you search for the most popular 144Hz gaming display, you will surely find the Asus VG248QE monitor at almost everywhere. It will deliver immensely superior performance over its competitors in the same price range. The rapidly fast response time of 1ms (GTG) and an ultra-fast 144Hz refresh rate is a perfect combination for a high-level gaming experience. It has a native Full HD (FHD) resolution of 1920 x 1080 Pixels with an 80000000:1 contrast ratio will provide stunning visuals on the 24-inch screen. The ‘GamePlus’ feature from Asus comes with timer functions & a cross-hair overlay is perfect for every kind of gaming environment, especially for the First Person Shooting (FPS) games. For the connectivity, it comes with one HDMI port, one DisplayPort, one dual DVI-D link, audio in/out ports, and two USB 2.0 ports. In the box, you will also get one power cord, one audio cable, a single DVI dual-link wire, a warranty info card, and a user manual. You will get a three-year warranty for the panel & system from the company. The AOC G2590FX is an affordable, highly specified display. 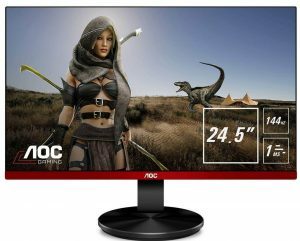 If you are one of those looking for a budget screen with supportive gaming specifications, then I would like to recommend this monitor by AOC. It has a rapid response time of 1ms and a native refresh rate of 144Hz. This 25-inch (24.5-inch viewable) screen supports Full HD resolution of 1080P (1920 x 1080 pixels). The NVIDIA G-Sync, adaptive synchronization technology, will deliver smooth gaming visuals to let you enjoy the gaming and HD video streaming at full. The advanced low input lag feature from AOC is perfect for enjoying lag-free gaming for fast-paced games. For the connectivity, it comes with multiple ports including HDMI, DisplayPort, VGA, audio, and USB connectors. It comes with a ‘Dial Point’ feature and a ‘Low Blue Mode’ for the pinpoint accuracy and flicker-free visuals in FPS games. You can also choose the option of 22-inch or 24-inch for the size of the screen. The Acer Predator XB241H will help you to use the full force of the NVIDIA GTX 1060 graphics card to have an amazingly fast & smooth gaming experience. Even though it has a TN panel which in general, lacks wide viewing angles and color accuracy like an IPS display, you will get an overall good picture quality compared to other TN panel monitors. It has a 24” FHD widescreen display which supports a resolution of 1920 x 1080 pixels (1080P). The Twisted Nematic Film (TN) panel has an ultrafast response time of 1ms with a 0.276mm Pixel Pitch for providing an enhanced visual experience. It comes with a native refresh rate of 144Hz which when you overclock, can go up to 180Hz. That means you will stay ahead of your competitors in the fast-paced games by seeing every detail with the frame changes. The NVIDIA G-Sync with flicker-less technology will reduce the eye strain and let you enjoy stunning visuals on the screen for an extended period. It has inbuilt two speakers (2W each) for an excellent sound output when you play games or watch videos. This display is 3D ready which means to enjoy the home entertainment on the 3D games like never before. It comes with HDMI, DisplayPort, and audio ports for the connectivity. There are other screen size options available including 23.8”, 24.5”, 27”, 28”, and 32”. The company provides a three-year limited warranty on the product parts and labor. 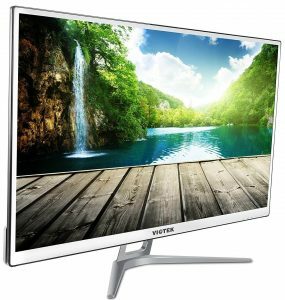 The VIOTEK’s ultra-advanced H320 LED monitor is perfect for PC gaming and productivity purpose. This white color product with a slim T-shape stand will provide an elegant look on your desktop while delivering superior performance through its top-class specifications. It has an ultra-large 32-inch screen with a 16:9 aspect ratio, 16.7M colors, and a 20000:1 DCR. The anti-glare technology from VIOTEK will reduce eye fatigue and strain when you sit in front of the screen for a long time. It comes with inbuilt DVI, HDMI, and VGA connectors for the different input options. It has a stunning native resolution of 1080P (1920 x 1080) on the IPS panel to ensure you will get full performance from your NVIDIA GTX 1060 graphics card. The H320 will provide excellent resolution and visual experience along with a low power consumption feature. That means you need not to worry about your electricity bills when you use this screen for long hours. 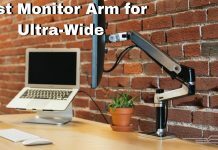 It has VESA mount capability, so if you want to save your desk space, then you can mount it on the wall & watch movies and videos from across the room. It comes with a plug-and-play functionality that means there is no requirement of installing driver or software while using it. You may be familiar with the BenQ products. But, it’s possible that you may not have come across many of their products due to the extensive database of the models from the tech giants. There are so many units from brands like Acer, Asus, Dell, LG, HP, etc. that products from companies like BenQ get unnoticed. Lack of top-class specification and quality are also some main reasons in a few devices from such brands. 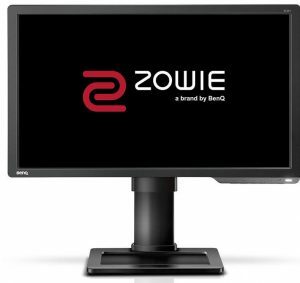 But, with the Zowie series displays, BenQ has taken the gaming market by storm. Its 1ms response time and 14HZ refresh rate provide you a competitive gaming experience in all types of games. The flicker-less technology and low blue light filter will minimize the distractions on the screen and let you enjoy the visuals at their best. Its dual HDMI input, HDMI output, D-sub, DVI-D, and headphone jack provide enough connectivity options. You will get an adjustable height stand with this display. It also has a VESA capability to let you mount it on the wall. The Black eQualizer provides visual clarity in dark scenes to let you see each detail on the screen. It is compatible with all the Windows Operating Systems. 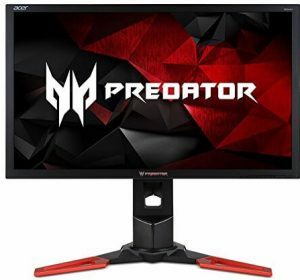 This monitor is widely used by the professional players and in the e-Sports tournaments due to the color vibrancy and other eSports-ready features. As we have seen that the NVIDIA GTX 1060 is a high-performing graphics card and to get the full performance out of it, you will need an excellent compatible system. And it can be hard to pick up the best display for GTX 1060 as there is not so much info on the web about the required monitor specification for it. 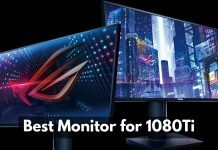 Here, I have tried to cover the valuable information which can help you to get the right monitor from the above list for the GTX 1060. While both types of panel are compatible with the GTX 1060, they have their own pros and cons. TN panel offers swift response rate of 1ms which cannot be achieved in the IPS displays. But the TN panel does lack the extra-wide viewing angles and highly accurate color reproduction ratio that you usually get in the IPS panel. So, choose the right display based on your needs like faster response in games, comfortable viewing angles from different positions, and the sRGB ratio. You may have seen that many blogs mention the right refresh rate for the games played on the screens. A few of them suggest that a 60Hz refresh rate is enough for almost all the games and that our eyes cannot differentiate the visuals more than that. But, it can be only believed after you experience the game-play on a 144Hz display. If you are on a budget, then 60Hz IPS display can do no bad to you, but going for a 144Hz monitor is a better option. As far as the matter of the NVIDIA GTX 1060, a display with 1080P Full HD (FHD) resolution can give the best output on your screen. You can go beyond that for the resolution choice, but remember that your graphics card may not perform at its highest pick with high-end displays. Well, this consideration depends more on your choice than the compatibility to the GTX 1060. You can get any display starting from 24” and can go to 25”, 27”, 32”, or even ultrawide curved displays of 42”. Remember your budget and the desk-space you have though. The cost of a display not directly affects the performance of the NVIDIA graphics card, but it inevitably tightens your hand for picking the monitor that fits in it. There is nothing wrong in going slightly over your budget if you are getting the display of your dream for the GTX 1060. 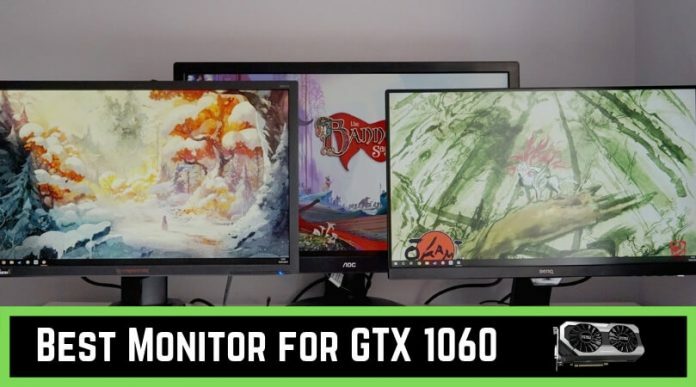 All the monitors listed here are well-performing and feature-rich products that can easily go with the NVIDIA GTX 1060 graphics card. The choice is yours. Depending on the factors I narrated in the above section can help you to pick up the right one. Which monitor will you buy for your GTX 1060? What is your PC configuration? Share your inputs in the below-waiting comment section.